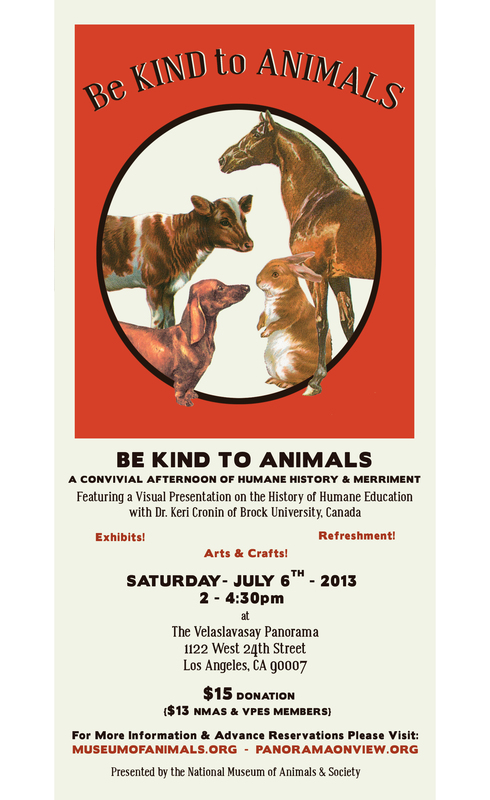 Next month I will be taking part in a really fun event, an event billed as a “convivial afternoon of humane history and merriment.” This event is hosted by the fabulous National Museum of Animals & Society and will be taking place at the Velaslavasay Panorama in LA. I will be speaking about the role of visual culture in humane education, with a specific focus on the late 19th- and early 20th- century. In addition to my talk there will be other activities taking place, including temporary exhibits, and crafts. I also hear there will be some yummy vegan snacks at this event. If you are anywhere near LA I hope you are able to join us for a fun day at this amazing venue! Sounds amazing wish I could see it in person! go as she fears seeing any gruesome or graphic content of suffering animals. She is very sensitive to those kinds of photographs and never looks at them. Actually, I don’t blame my friend, as I’m the same way. this event, but I’m not 100% certain. I was just expecting to see some nice old posters for animal welfare. upset my friend? I would really like for her to attend this event. I very much look forward to your talk and presentation! p.s. I wrote to your email address at the university, but it bounced back to me saying that you’re out of the office for many weeks. So, I hope to reach you here for a reply. Thanks for your note, Jamie. Sorry I didn’t get a chance to reply to this comment sooner. I made certain that the images in this presentation were not graphic in content. Hope you were able to join us for the event!